I always love the articles written by Glen Wang, one of my former students. He has written another good one called “Manage Objectives, Actions, and Uncertainty in Scrum“. I’ve added a bit of feedback because I think there are some important changes that need to be made to the article, but overall I love the concepts, information and presentation. Over the past six months we have been working hard on launching a new product: The Scrum Team Assessment. This tool delivers to you a valuable report full of practical advice on how your team can get better at Scrum… and deliver better results! It’s like an automated Scrum coach. All your team members will fill in a comprehensive survey, we collect the results, generate a report – and then we personally review it – and send it back to you. For more information, please visit our Scrum Team Assessment site. This is my first crack at a series of posts intended to document reflections, insights and experiences that have been generated over the past several years at Berteig Consulting in our work helping organizations to transform with Agile methods and approaches. The most recent iteration of our collective practice is the Real Agility Program. The Program was created as a flexible yet systematic process for developing high-performance teams. The Program involves assessments, training, leadership and delivery teams coaching and internal coach development for teams and organizations that want to transform in order to become hyper-productive, lean and robust. A central tenet of the Program is that teams are organic in nature. They are living systems that grow and develop in the right conditions. They also develop in stages. The Real Agility Program addresses the natural stages of team development with a sequence of steps or “sections”. Much like a seed, a new team has the latent potential for developing into a complex organic system of high-performance capabilities. Capabilities of high-performance start out as a simple set of attributes and grow in complexity and strength over time. Capabilities to carry out more complex activities are built onto capabilities for more simple activities. Little by little, high-performance can be realized in this way. Something that most teams need help with early on, particularly if they do not already possess a growth mindset, is overcoming the false dichotomy between theory and practice. An indication of this is when we hear people say things like “well, that makes perfect sense in theory, but it’s just not practical for us.” Or “we need help to put that theoretical idea into practice in our own reality”. This reveals a mindset that conversations around concepts and ideas are only valuable if they can be implemented immediately in a measurably beneficial way. The desire for technical recipes is understandable. They can help with immediate pain relief. They are not the most effective way to build capabilities. The Tree of Organic Growth is an exercise that we often share early in the Program and is designed to help teams develop a more integrated mindset and approach to capacity building (very similar to The Tree of High-Performance in Lyssa Adkin’s wonderful book Coaching Agile Teams). The facilitator usually starts by drawing a simple diagram of a whole tree, including the roots. Sometimes, simply exploring the concept in a conversation serves the purpose just as well. The team is asked to identify values, concepts, principles, qualities, skills, attitudes, habits and knowledge that are already present on the team that will serve as roots for building capabilities of high performance. The conversation is not merely a nice, (“fluffy”) theoretical stroll in the proverbial park, but a critical aspect of the hard work of re-shaping thought, which in turn re-shapes reality. Let’s look at an example of the aspects of building a specific capability. 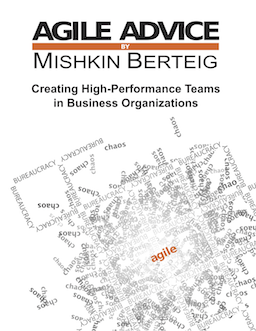 A well-known Agile capability of high-performance is the self-organization of the team. On one level, it starts to happen as soon as a group of people come together to accomplish something and no one person is identified as the “boss”. Without certain capabilities in the members, however, this can get very Animal Farm in almost no time. High-performance requires the development of qualities, attitudes, conceptual knowledge & understanding, habits and skills in all members of the team. For example, team members need to develop the qualities of openness, integrity and helpfulness. Attitudes such as a humble posture of learning and serving the team need to be developed. Knowledge of concepts such as consultative decision-making and Wideband Delphi and how self-organization differs from traditional command and control project management needs to be developed. Good habits and practices such as regularly coming together as a team to reflect and plan are essential for the team to become able to deliver complete increments of high value often. And, of course, team members will need to learn skills in terms of communication and collaboration, as well as other technical skills that may have previously been outside of their formal roles. Furthermore, everyone can develop in any of these areas of any capability at any given time. Just like in any organic system, capabilities of high-performance benefit from constant nourishment, feedback and reinforcement. Growing a high-performance team is a complex process that requires a great deal of effort, patience, time and a supportive organizational environment that will allow for all of these aspects to develop on a team. It is an investment in people as much as it is a business decision. There are no shortcuts or formulas, but with the right conditions, every team has the potential to develop capabilities of high-performance.